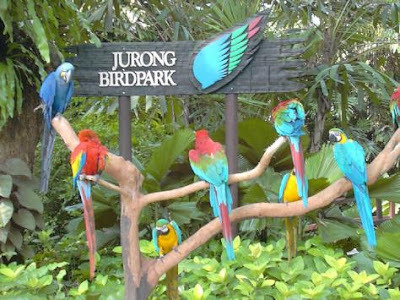 Last Saturday night, the family and I trekked across to the west to attend the latest live show at the Jurong Bird Park. Having never been to a live magic or illusion show, it was in fact something quite amazing to behold. “Illusionist Extraodinaire”, Priscilla Khong led us, along with quite a large crowd at the Park’s “Pools Amphitheatre” on a journey of light, sound and spectacular magic combined with some of the fine-feathered creatures that call Jurong Bird Park their home. I’ve attached below some of the pictures that we took of the stage and audience (and Sammi & Jaime) from the night’s event… but please don’t tell the bird park authorities – they clearly requested people not to take pictures or videos during the show (whoops). A widely acclaimed professional female magician, Priscilla Khong has been honing her skills from young, picking up the craft from her father, Lawrence Khong, and various legendary master magicians. The talented illusionist has been performing on stage since 2001, incorporating her background in various dance forms to design visually stunning shows that thread each magic routine with complementary music and props. The seamless choreography gives audience a multi-sensory magic extravaganza every time.